By Todd YoungbloodOctober 12, 2018Learn!, Lifestyle, Think! Before I get into the meat of today’s topic I need to acknowledge that there’s a self-serving aspect to what I’m going to discuss. Self-serving, yes, but frankly, it’s legitimately a Public Service Announcement. The topic is podcasts, more specifically, the fact that this treasure-trove of information, insight and entertainment is largely ignored and therefore for the most part a depressing, gigantic waste. You’d be perfectly correct to point out that I, as the producer of a podcast, have a strong bias here. I get that. However… Mine is just one of over a half a million available podcasts, and I am genuinely convinced that the podcast medium itself is immensely well suited to the demands of a 21st century American lifestyle. I’m promoting podcasts in general as an outstanding medium to feed your brain. I’ll state my case supporting that contention, offer a few thoughts on why listening to podcasts is growing as slowly as it is, and finally ask you – obviously a podcast listener – to do your family and friends a big favor by introducing them to this massively useful resource. Friends Don’t Let Friends Miss The Boat! Did I mention that you will never run out of free content that is exactly the kind of content you need and want? I think through just those few reasons and get even more baffled by the hoards that are not yet podcast listeners. Especially when I think about how many hours people spend alone in their cars. Considering statistics for just the city of Atlanta, over a half a million people spend just shy of an hour commuting to work in the morning and then reversing the process in the evening – day, after day, after day… Why would they not spend at least 1 of those 10 cognitively dead hours a week feeding their brains? Personally, if I’m driving with nobody else in the car, I’m listening to a podcast. While 64% of Americans say they are familiar with the term “podcast,” only 17% of people over 12 years old – about 48 million – actually listen to at least one on a weekly basis. For contrast, over 90% – 180 million people – almost quadruple – watch a TV show. Why so relatively few podcast listeners? Well… Many of my friends, who for the most part are baby-boomers like me, admit – sometimes only after a bit of badgering – that they simply do not know how to listen to a podcast. Turns out that’s why fully 48% of people who have never listened to single podcast, haven’t listened. Really? People can’t figure out how to listen to a podcast? Ummmm… I guess not. Help me out here, podcast listeners. Do your podcast-challenged friends a favor. 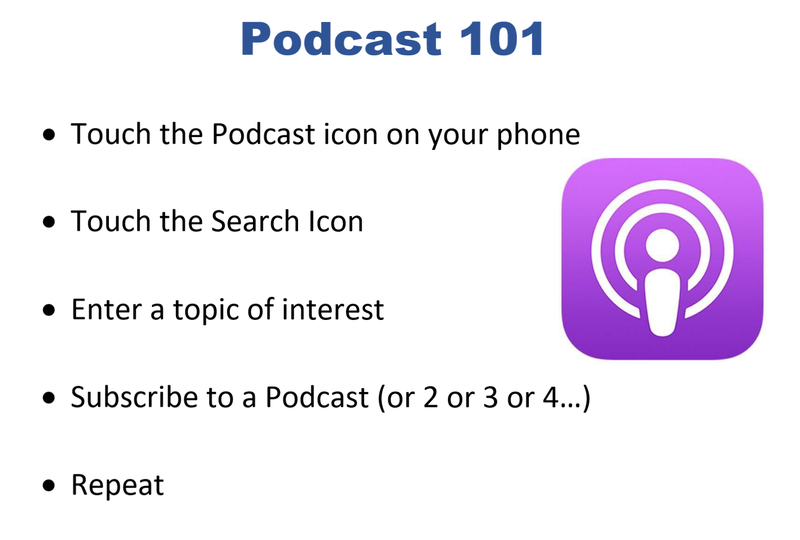 Talk them through how to click on the podcast app – which is pre-installed on every phone in the universe – click the “Search” icon, type in a topic of interest, pick a podcast, then listen. It’s a 30 second exercise that will provide them with literally unlimited value and listening pleasure. They’re forever be in your debt! 11 million people sit through a hour of America’s Got Talent every week. Ummm… Actually, that’s not my point. My point really is that 11 million people sit through 14 minutes of mind-numbingly annoying commercials to soak in 46 minutes of America’s Got Talent – every week! Another 5.5 million people sit through 7 minutes of mind-numbingly annoying commercials to absorb 23 minutes of Young Sheldon – every week! The average American adult watches 70 minutes of TV commercials per day. 70 minutes of TV commercials per day??? Sounds like cruel and unusual punishment to me. And that’s on top of 3 hours and 50 minutes of the mostly mindless drivel like America’s Got Talent, Young Sheldon and reruns of Gilligan’s Island pumped out by the networks. Do you get my point? This really is a Public Service Announcement. It’s my personal request for you to do your friends and family a giant favor. Turn them on to podcasts. Help them feed their brains! I’m your Intentionally Vicarious host, Todd Youngblood – crossing my fingers that you’ll choose to turn your family and friends on to the Intentionally Vicarious podcast, but really hoping you’ll get them hooked on any podcast – get them hooked on the medium. Tell ‘em that you are hooked on podcasts and like me, you’re having more fun than anyone else you know. Thank you. Well thought out, as usual.